The weekend of September 24-25, Erik, Greta and I traveled down to Oslo to meet up with Erik's parents during their last weekend in Norway. We found a reasonable hotel near Oslo Sentralstasjon (train) and the Rådhuset (city hall) on the main Oslo harbor. Erik and I managed to navigate downtown Oslo in a car for the first time, at 10pm at night. Saturday was cool (but not rainy!) 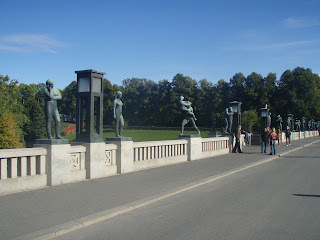 and the city was mobbed by people running the Oslo Half Marathon and Marathon the next day. Saturday had many pre-race events, including a 3K that wound its way around many of the sights near our hotel. We spent Saturday enjoying the views from Akershus Fortress, the harbor near Rådhuset, and enjoyed a delicious lunch at Aker Brygge, the shopping area near the wharf. 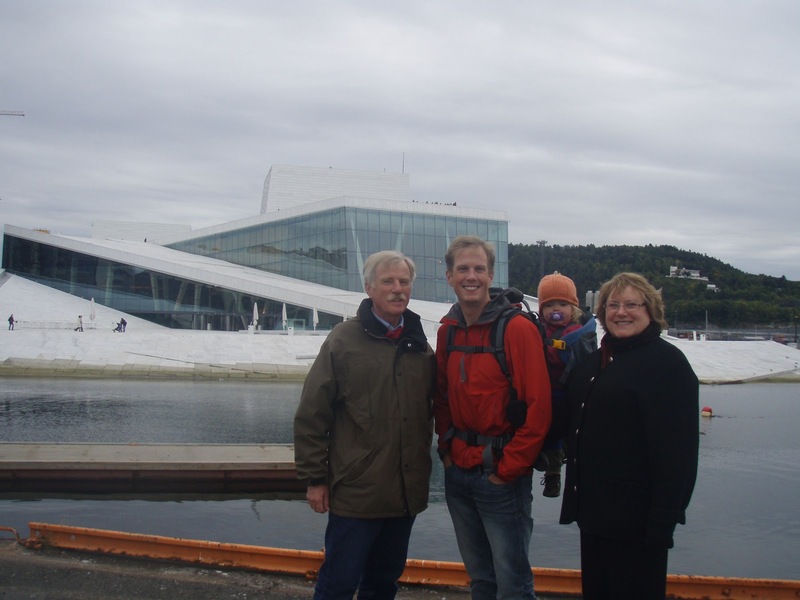 That evening, after Greta's afternoon nap in the hotel, we wandered over to the new Opera House, and walked up the slanted roofs to the top overlooking the harbor. We peeked inside the lobby of the opera house, which looks really beautiful. you can climb on the roof! On Sunday morning we hopped on a tour boat of the Oslo harbor that took us from the Opera House to Bygdøy, where 3 of Oslo's main attractions are located: the Vikingship Museum, the Kon-Tiki Museum, and the PolarShip Museum. 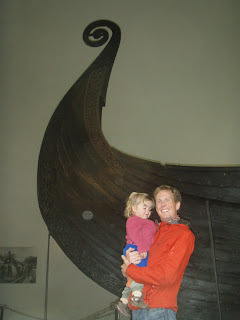 Erik and I have seen all three, and we had a nap schedule we wanted to adhere to, so we limited ourselves to 30 minutes in the Vikingship Museum. It's a very interesting exhibit, and I highly recommend it. Sunday afternoon was a brilliantly sunny day, and while Greta napped and Erik caught up on work, I wandered past the runners loping down the main pedestrian shopping street, Karl Johans Gate, and up to the royal palace, Slottet. 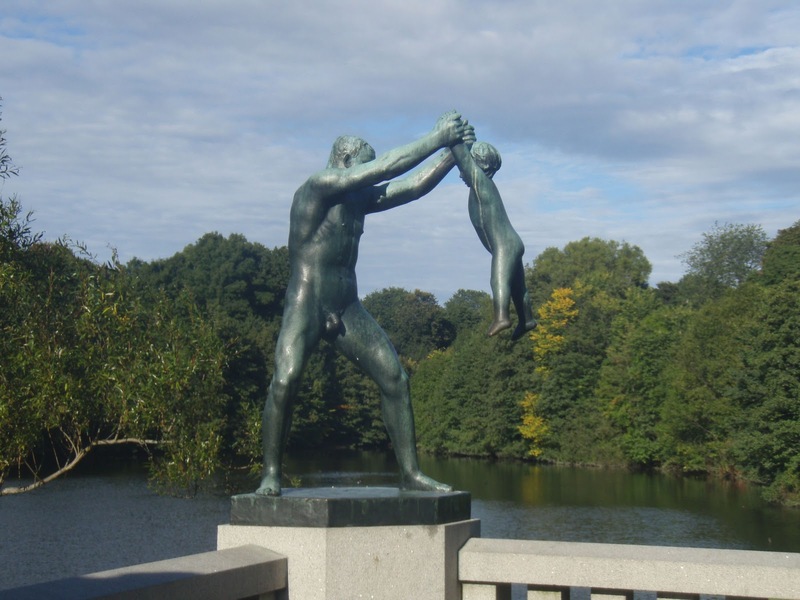 Feeling inspired by the fresh air and a few spare hours, I walked to Vigeandsparken, also known as Frogner Park or Vigeland's Sculpture Park. The park is filled with over 200 sculptures and statues of the life's work of Gustav Vigeland. It is an enchanting place, and probably the most unique and interesting side of Oslo. 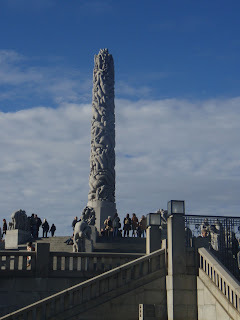 We were planning on meeting Erik's distant cousins, the three Tveter siblings and their families, for dinner that evening near Holmenkollen, the ski jumps that overlook the city. 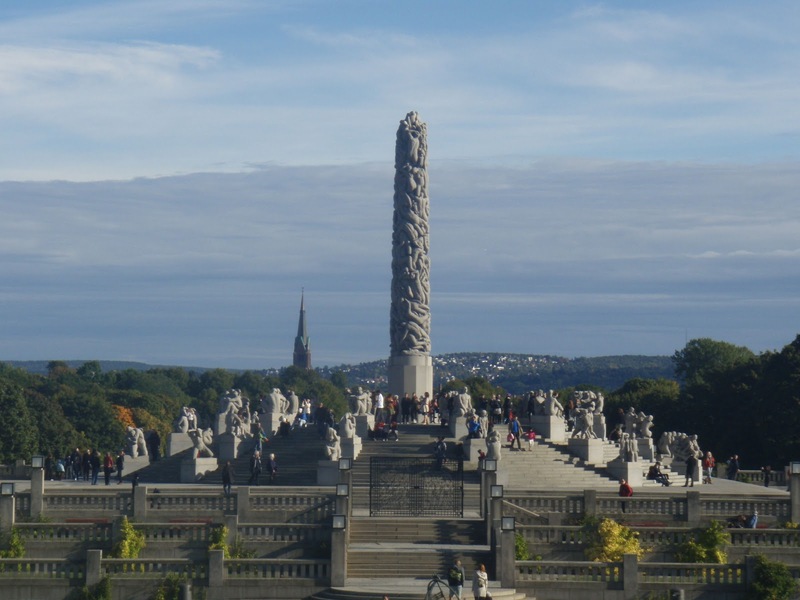 Erik agreed to pick me up near Frogner Park to allow me to savor the sunshine at the park, however we hadn't determined a time or place when I had left. That's what cell phones are for, right? To pass some time, I sat down and tried to fix an annoying feature on my cell phone. After a few options, the phone asked me to "clear settings" or "reset settings" or something like that, which I agreed to do. BIG mistake. It basically locked me out of my phone, asking me for PIN and PUK codes, which I had no recollection of. I was stuck. After a few panicky minutes--it was getting very close to 4pm, when Erik was going to leave the hotel--I asked a nice looking Norwegian couple pushing a baby stroller (basically every other couple) if I could borrow their cell phone. Of course, I couldn't remember Erik's phone number the first few times, but eventually contacted him and set up a meeting time and place. Crisis averted. Yes, sounds so calm now. Not so calm then. We had a lovely dinner at Frognersentern, a historic hotel overlooking the city, reacquainting ourselves with Erik's cousins--our only family in Norway! They were incredibly welcoming to Erik when he was a student here 15 years ago, and have hosted us on both of our visits to Norway. 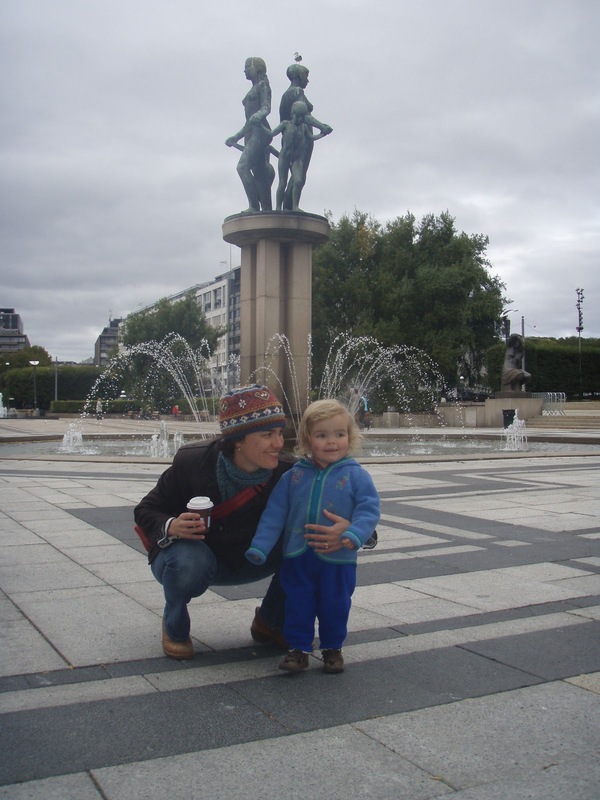 Visiting Oslo with a 2 year old was a very different experience than our last visit 3 years ago, as you can only imagine. The boat ride was a big hit, as was running around the harbor. I think Frogner Park also would have been very enjoyable, so we'll put it on our list for next time. There are still many things in Oslo that we haven't done (or I haven't done), and many more visitors to come (we hope), so I'm sure we'll have plenty of opportunities to find some more favorites. Ok fellow bloggers. Is it just me, or is Blogspot completely irritating to use? The font changes unexpectedly, the pictures jump around the screen no matter where you put them, the text doesn't go anywhere but exactly where you DON"T want it to go, you can't really see what your page will look like when you're writing it.